I was tagged yesterday by the lovely Lisa from The Domestication of a Party Girl. Here's a photo from my Photo Bucket account, sadly I have no real juicy story to tell regarding this photo. I don't remember a single thing about that day. I don't remember if we took the Long Island Rail Road and then hopped on the 2 train/subway to get there. Maybe my Dad drove? I don't remember what Mom packed us for lunch or how I reacted to the many different animals. I do know that this wasn't my only trip to the Bronx Zoo. Around the time this photo was taken, I believe I tagged along with my mom and her 4th grade class. Living only an hour outside of Manhattan, we hit The Bronx Zoo a few times. Funny, we never once visited the Statue of Liberty. Good thing because even as a kid I'd never make it up those steps! Obviously that's me and my little bro. I'm guessing the time frame might be like Spring of 1982 which would make me, 10 and my brother, 6. I am sporting my beloved soccer jacket--the letters read "VSSC" for Valley Stream Soccer Club. My brother is wearing a really ugly wool hat. I remember that hat well because I refused to wear it. I'm thinking a family member may have knitted it for us. As an adult, I still hate scarves, hats and gloves. When I was a little kid I loved this song by Simon & Garfunkel. I always thought it was about The Bronx Zoo because in the late 1970s or early 1980s this song was used in commercials though I believe the song is actually about the Central Park Zoo. What a cute pic. You and your bro look joyful. I love S&G, but that song's unfamiliar. (I'm an ole lady compared to you, so maybe I was onto different music when it came out.) It's very sweet. Awww... cute picture! You guys looked SO happy. You must have had a heck of a time! Robyn, this song is from 1967. I think it's off their hit album, Book Ends. Cute pic! I actually dig that hat your brother is sporting. I would so wear it! You two are adorable in that picture. At the zoooo! At the zooo!!! Used to love that commercial. Very cute pic. I'm thinkin' you took LIRR. I just have a feeling. FYI...I remember I had about 4 of those soccer jackets. I was like the mintest looking 11 yr. old of '82. Nice pic and not being able to view the vid can you clue me into what song it is? What a couple of cute kids! Aww. Its an adorable picture! You can tell how happy you were! On another note, in the winter i don't leave the house without my scarf, hat and gloves. The scarf keeps the wind from blowing on my neck. Aww, such a cute pic! I think the hat is kind of cute, lol. Cute! And I love that song. Aw, cute! I love the Bronx Zoo, too. As a kid I did visit Statue of Lib/Ellis Island, and don't remember any step climbing but man was it cold. Wow. You were rockin' that wind breaker. So cute! You look really happy! And ummm...I kind of love that hat. I would probably wear it now. I swear to god every kids had a jacket just like yours with their school colors / sports logos. Wasn't that great? Absolutely no choices whatsoever. Don't get me started on scarves. My mom knitted meone each year and it wrapped around me 3 times. Thanks for sharing your memory with the photo tag! Do you remember what animal enclosure you were in front of? I don't blame you with the whole Statue of Liberty steps.... When I was younger, I went to France with my brother.... We go out of the subway and were posed with an easy decision. Either go up the elevator, or take the stairs. Love the hat on your bro. Didn't we all have a Aunt, Grandma, Nana, etc. that knitted us hats or scarfs or gloves? And - being the good kids that we were, we wore them - and our moms made sure that we did! 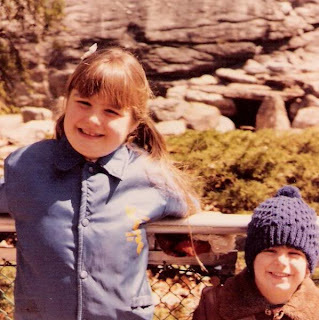 I was at the Bronx Zoo only once and that was in 1981 with the Girl Scouts. I remember being on a camel there. Sorry that you don't remember much about your experience here. I was at the Statue of Liberty in the early 80s too but can't remember if it was a class trip or a GS one.